Oh, will I ever get tired of the awesomeness that is Modern Mechanix? The latest handy helper from the past that we know about from Modern Mechanix is this advertisement for cartoon training, which looks to be a correspondence course. A new idea in cartooning schools -45 lessons by NINE Famous Professionals:-Boltinoff, Lariar, Nofziger, Roir, Ross, Roth, Salo, Schus and Wolfe. Over 2,000 instruction Drawings! Course includes: Comic Strips, Magazine, Sport, Politicals, Animals, Advertising, Book Illustration, CUTE GIRLS, etc. Your homework criticized by all 9 famous teachers. 2 years to finish. 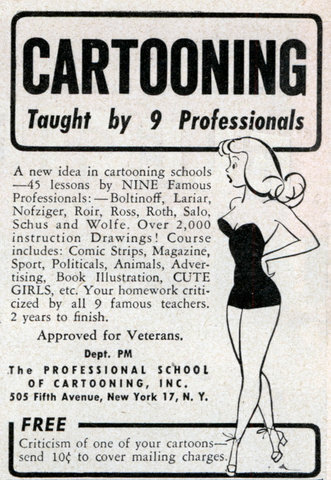 The PROFESSIONAL SCHOOL OF CARTOONING, INC. 505 Fifth Avenue, New York 17, N. Y. FREE Criticism of one of your cartoons- send 10c to cover mailing charges. I think the “Approved for Veterans” part refers to military vets, and not pet doctors. Not that there is anything wrong with the doctor who cares for your pet drawing cartoons. I just thought I’d try to clear that up for those not sure who is the target audience. For the record, the answer to the opening question is, of course, a most emphatic no. I mean, how could one ever tire of greatness in a single URL? Previous Previous post: Best Snake game clone ever?